"found that an increase of ten percentage points in mobile-phone adoption in a developing country increased growth in GDP per person by 0.8 percentage points." Even if this sentence isn't entirely clear about the flow of causation, there are plenty of reasons identified in this article, and many others, to consider mobile phones as being good for an economy. Now look at the graph. 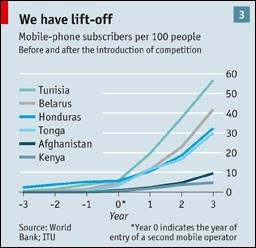 One country is the laggard in mobile coverage: Kenya. If you believe the World Bank story - which is plausible and backed by bucketloads of anecdotal evidence - something is holding back Kenya's mobile market, and by inference its growth. "The current GSM (Global System for Mobile Communications) service providers, Safaricom and Celtel, are demonstrating duopolistic tendencies, with each refusing to lower cross-network call charges." Why could that be? Could this (from last year) have anything to do with it? "While the government insists it currently owns 60% of Safaricom with the other 40% in the hands of UK giant Vodafone, opposition groups say another firm called Mobitelea also has an interest. Registered in Guernsey in the Channel Islands, Mobitelea's owners remain unknown. Media reports in Kenya have speculated that Mobitelea owns as much as 10% of Safaricom. "They [the government] should have told this country who Mobitelea is, and whether they acquired the shares procedurally," opposition MP William Ruto told the BBC." "The Government is reluctant to disclose the owners of Mobitelea Ventures, the shadowy company behind a 12.5 per cent ownership of Safaricom. The Minister for Finance, Mr Amos Kimunya, said the Government would not investigate the owners of Mobitelea despite pressure to do so by ODM and non-governmental organisations." "Documents obtained by the Guardian show Mobitelea was registered in Guernsey on June 18, 1999 - several months after Vodafone had struck a preliminary deal with the Kenyan government. Mobitelea's real owners are hidden behind two nominee firms, Guernsey-registered Mercator Nominees Ltd and Mercator Trustees Ltd. The directors are named as Anson Ltd and Cabot Ltd, based in Anguilla and Antigua." And some more details emerged here. Could this mystery company be behind the "duopolistic practices" that have kept competition down, and prices up in Kenya's mobile market -- and, by extension, Kenya's entire GDP growth rate? It is a plausible story, though there could be other reasons too. Whatever the truth, TJN's director, John Christensen, knows from first-hand experience of working in the financial sector in Jersey that offshore companies are regularly used for this purpose: collusion, market-rigging, insider trading and many other market abuses. At one stage he administered a company belonging to a prominent South African politician, who used nominee shareholders to disguise his identity and various conflicts of interest relating to transport infrastructure. Another client was a European aggregates business using an offshore company to disguise a monopolistic market position in cement supplies in a west African country. These are just anecdotes, but the problem is systemic. The secrecy that these places provide serve as a cover for a litany of practices that undermine the integrity of markets, and our faith in them. And they happen as a matter of routine. Update: October 29th - a very similar question being raised in Belize. What will Cayman do next?